The BBC has, once again, become a major source of vicious hatred against Jews and Israel in the English speaking world. One can only shudder if you thinks about what hey are broadcasting on their Arabic and Parsi services.They accuse Israel or targeting civilians but totally ignore the fact the every rocket and missile that Hamas has fired has been directed at the Israeli civilian population in cities, towns and settlements, almost all of which are with the “Green Line”. The BBC and others, like SKYNews, have failed to report that Hamas is preventing the people of Gaza from leaving their homes when warned by Israel that their houses which are being used as rocket launching sites, will be attacked. Hamas’ actions have been reported by Palestinian TV which broadcasted a Hamas spokesman telling people not to leave their homes! The BBC and other British media are using the Palestinian/Israeli conflict to justify the on going hatred of Jews which has been evident in the UK for hundreds of years. The sad thing is that Jew hating Jews, like Sir Gerald Kaufman MP (Labour), are in the forefront of the hate war against Israel and close their eyes to the atrocities committed by Islamic terrorists, or as the Islamaphobic media call them, “Militants, all in the name of Islam, in Syria, Iraq, Afghanistan, Pakistan the Maghreb and East and West Africa. 200,000 (20,000 children) plus dead in Syria, thousands of Muslim killed by NATO, hundreds killed in Drone attacks all over the place and now 100 “dead” or “maybe dead” like in the 2nd Lebanon War, in Gaza’s Hamastan. sworn to destroy Israel and the Jewish People, and Israel is the bad one? 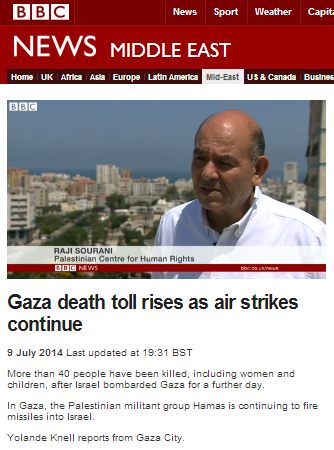 Double standards have nothing on the bias shown by the BBC again Israel ans Jews. Hitler would have been very proud of the BBC! Why has Israel killed so many civilians (and after a week of massive bimbing it is an incredibly low number). Why have so many Hamas “operatives” managed to flee and hide? How are they launching hundreds of rockets and not being killed? Clearly Hamas has built shelters for its own operatives while leaving the civilians to be PR fodder.